Replacement for the original PLA from Commodore. 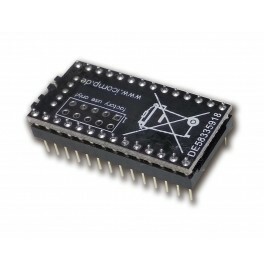 SuperPLA is a replacement part for the Commodore PLA chips which are based on the 82S100 chip. SuperPLA does NOT add any functionality, but replaces a chip that often breaks on vintage Commodore computers. A broken PLA will keep the whole computer from working - SuperPLA is meant for repair jobs like this. • Assy. no. 250469 is not supported! SuperPLA has been available in various versions, which are all united in the latest V4 now. It will be shipped in antistatic packing. This product is shipped without printed manual. Details can be found in the Wiki article for the SuperPLA. Two improvements have been made compared to the previous version: SuperPLA V4 now works with the "Epyx Fastload cartridge", which was popular in the US. Further, the part is considerably smaller - only a fraction of a mm bigger than the original chip.